NORTH BEVERLY - Charley Baer's plants look parched and shriveled, as though a major drought has hit the region. But this is a good sign. Baer's Best beans are almost ready to harvest. Out of their brown pods, these heirloom varieties, grown here on Moraine Farm, are tiny paintings. There are calypso beans, each half black, half white with a black dot in the white; maroon and white speckled Jacob's cattle beans; white bumblebee beans marked with a brownish red shape that resembles a bee with folded wings; mottled Appaloosa; and brilliantly red Scarlett Beauty. It's as if an artist specializing in miniatures carefully painted each oval. Though this region is famous for pots of beans, they're not planted much here. "Boston was once known as Beantown," Baer says, because the pop ulation survived winters on beans like his. Now he's one of the few commercial growers in the Northeast. It's a skill and passion he learned as a hobby more than 20 years ago when a friend in Maine bought 60 acres and started to grow beans. Baer has been farming in Massachusetts since 1994, when he and his wife, Carol, saw an ad in a local farm magazine for fields for rent. "Dry beans were a winter staple," he says. That changed when California began shipping fresh produce east year-round. Many cooks think that dried beans last forever, that they can't go stale. But simmer beans that have been on a shelf for several years, and you'll see that's not true. "You can tell beans are too old when you cook them and cook them, and they never soften," Baer says. Heirloom beans like Baer's are prized not only for their unusual shapes and colors, but also because freshness makes a difference. Picked in September and eaten through the next year, the beans take much less time to cook and have better flavor. As colder weather approaches, dried bean sales rise, says the grower. This is baked bean and bean soup season. New Englanders' love of beans dates to Colonial times, when Native Americans taught settlers to grow them. 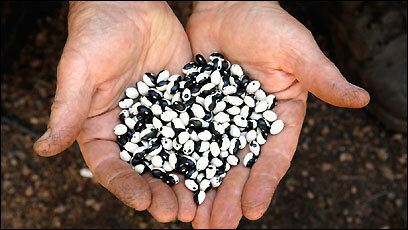 Old varieties such as soldier beans and Jacob's cattle have always been popular. Nowadays cannellini, black turtle beans, flagelots, and others have gained ground. Baer specializes in unusual varieties such as the large, striped Boston Roman, but also grows some varieties such as edamame to sell to small seed companies, including Johnny's Selected Seeds in Maine. That's about one-fourth of his business. Because some beans, like lentils, don't grow well here, Baer fills out his inventory by buying small amounts from growers in other parts of the country. In Baer's fields, the long, browning pods hang off low bushes in fields rimmed with plots of heirloom tomatoes and other vegetables. After years of farming beans - over 100 varieties at various times - he has learned what doesn't work. "I tried chickpeas," he says, "but they didn't make it." They grow close to the ground, unsuitable for the Northeast's often wet weather. "You want your plants upright," he says. Rain, or even the heavy dew of late summer and fall, will cause moisture to leak through the pods, staining the beans or even rotting them. With a long dry spell in August, this season has been good, but heavy rains could do him in. "Ten years ago," Baer says, "I lost five acres." That meant about $7,000 in revenue. Besides rain, he worries about deer, which love to snack on the protein-rich pods. Otherwise, the cycles are much like any farmer's. But Baer leads a split life. His day job is working as a chemist testing water purity at Thermo Fisher Scientific's office in Beverly. "I've been all over the world," he says, testing the purity of drinking water and checking water in power plants in China, Germany, and the Middle East. During the most intense periods of farming, he can easily put in another 40 hours a week planting, harvesting, and readying the beans for market. It's a long growing season - 90 to 100 days for some of the varieties - and after the harvest, the beans must go through weeks of drying, cleaning, sorting, and packaging to be ready for sale the next year. The whole operation is done manually or with machinery that bears 100-year-old patent dates. Baer believes that unusual varieties and high quality are more important than volume. His grain seeder - he nourishes the fields with winter rye - is one of the first commercial models sold in the early 1900s. "This tractor is older than we are," says Baer, 56, of a harvesting machine without power steering. A bean sorter (patent date: 1903) has a new motor. "I learned to be a pretty good mechanic," Baer says. High school students help with the harvest. "They always love to drive the tractor," he says. Ordinary household fans, aimed at burlap bags filled with beans, run almost constantly for several weeks to dry them. After they dry, they're picked over for broken pods or grit and packed into clear cellophane bags, a label depicting a bear holding a pot of beans goes on each one. By late fall the beans start going to market; they sell for about $2.98 a pound. Seed companies want beans in January for their catalogs. By March, Baer is planning his next season. For now, on a clear, dry autumn day, he surveys his plants with satisfaction, a farmer anticipating a good harvest. "If it doesn't rain until November, it's fine with me." Baer's Best Beans are at the farmers' market on Saturdays in Marblehead (Veterans Middle School) and on Thursdays in Gloucester (50 Harbor Loop), and at A. Russo and Sons, 560 Pleasant St., Watertown, 617-923-1500, russos.com; Idlewild Farms, 366 Central St., Acton, 978-263-5943; and Wilson Farm, 10 Pleasant St., Lexington, 781-862-3900, wilson farm.com.